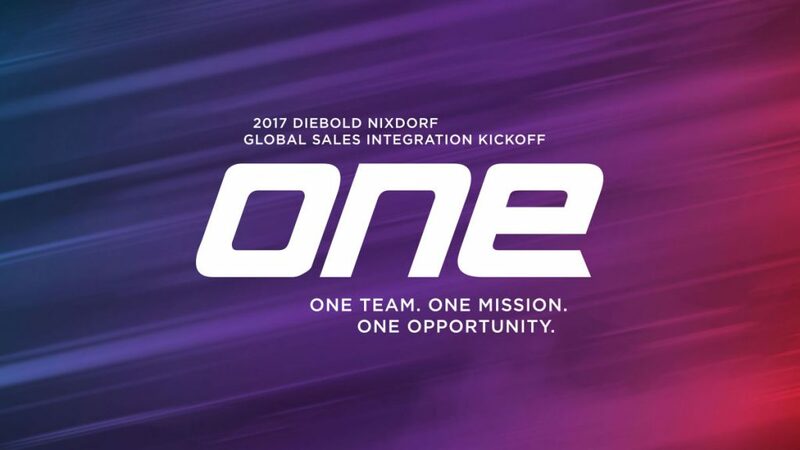 Create an event that introduces a newly-merged company (Diebold + Wincor Nixdorf = Diebold Nixdorf) to their international audience of sales-force attendees from over 70 countries. 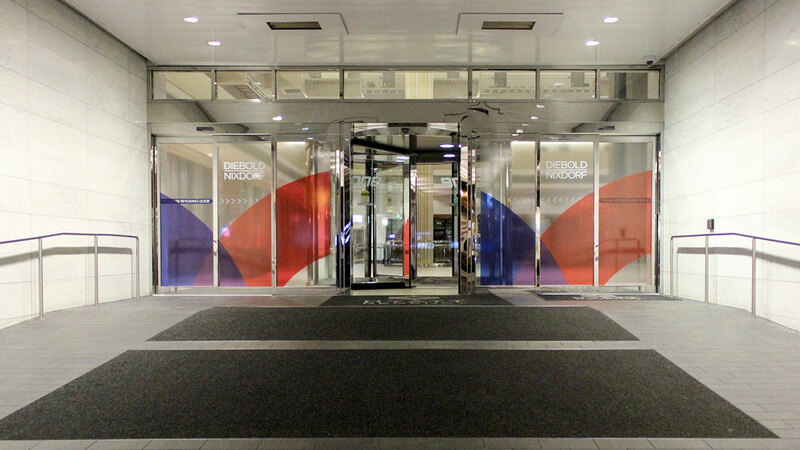 The strategy? 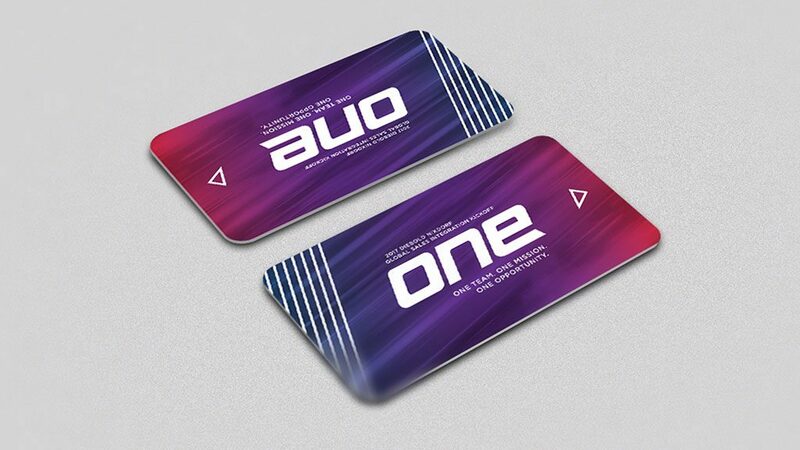 Develop and communicate the overall concept through storytelling, digital media, and physical assets. 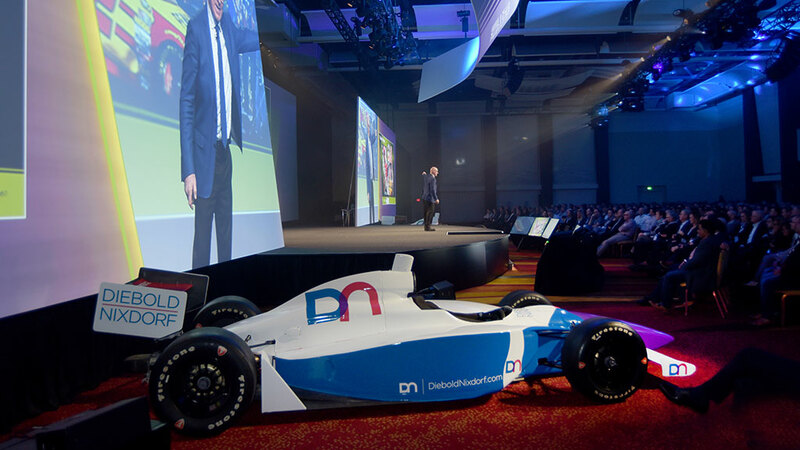 Combine the competitive spirit of finance and banking into a shared vision for connected commerce using a vehicle that is both figurative and literal: A race car. 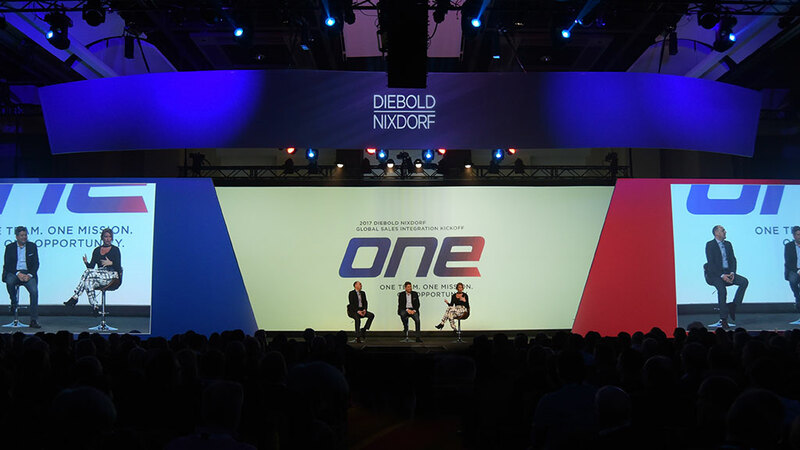 Using the theme of Formula One racing, the event united the diverse aspects of the two companies into ONE team, with the common goal of reaching the finish line first. 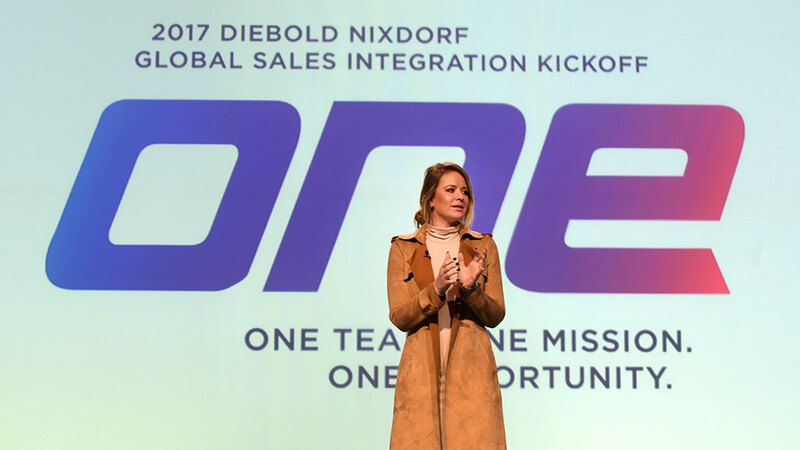 Attendees from around the world understood the challenges of combining varied skills and technologies toward the common goal of finishing first, and immediately embraced the racing metaphor. 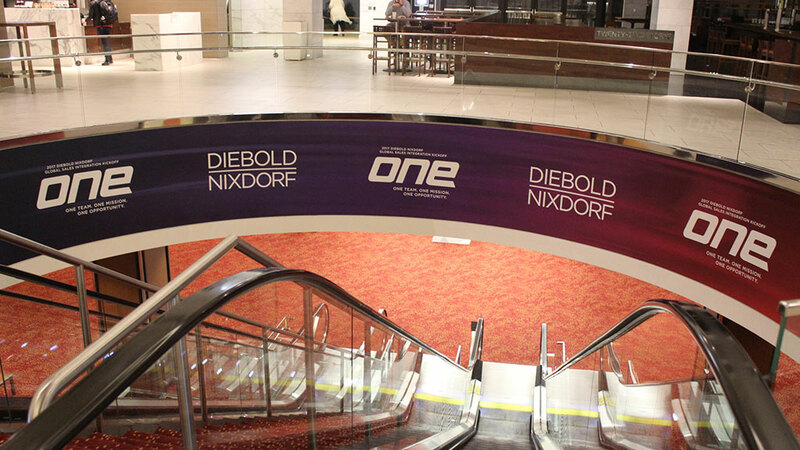 Attendees were captivated by consistent branding that showcased their new identity: The new colors, a combination of the two companies’ legacy colors (blue and red), and a complementing purple in perfect balance; branded lobby elevators racing up and down the 22-story atrium; a wrapped escalator, which served as a portal to the main level of activity; and important touchpoints throughout the hotel – including signage, key cards, and registration. 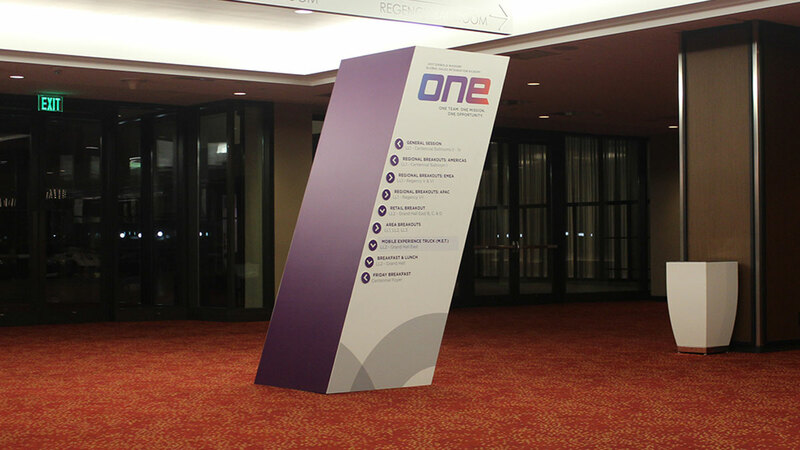 The general sessions told the story of the entire race, from start to finish. 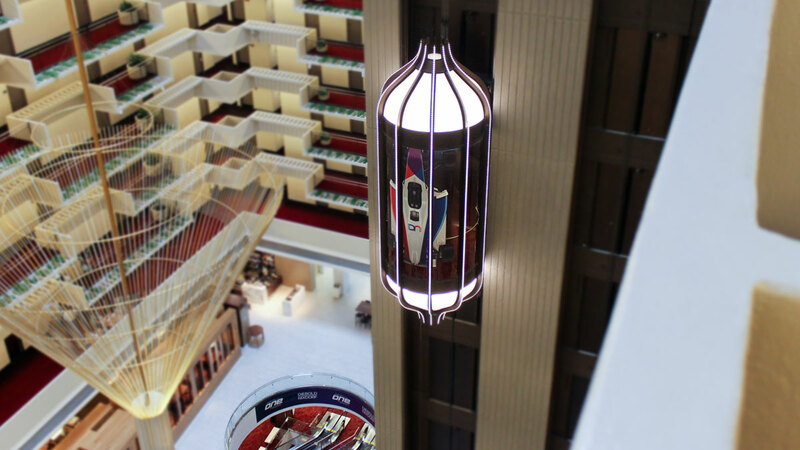 The epic tale was narrated in a high-tech, stylized video from the driver’s point of view, giving his perspective on strategizing the course, sizing up his opponents, crossing the finish line, and acknowledging the contributions of the team that enabled him to win the race. 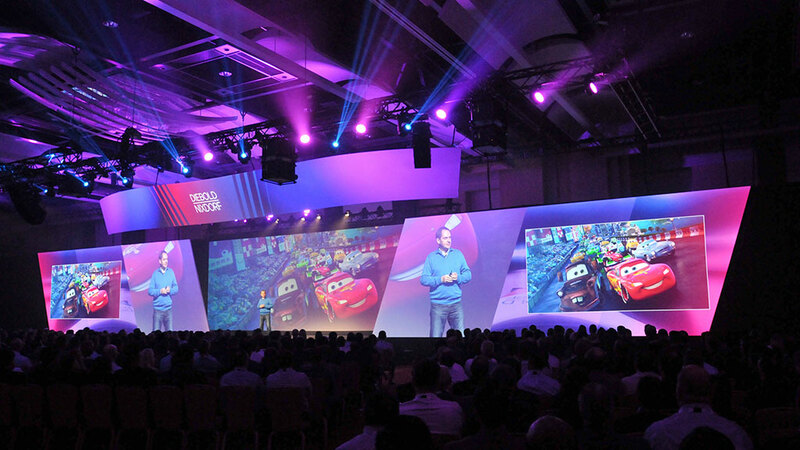 Media was carefully researched and scripted, and provided structure to the presentation content of the three general sessions to inspire guests and extend the racing metaphor. 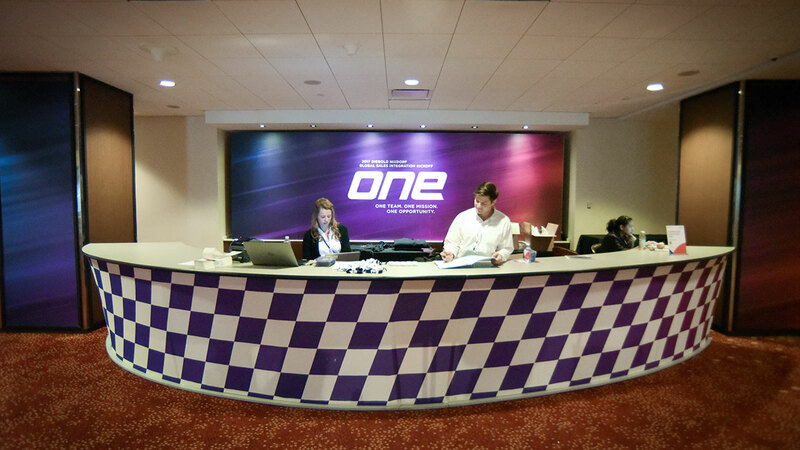 Stylized, computer-generated footage of cars racing set the stage for champion presenter Derek Daly and the Mistress of Ceremonies, sports anchor Kristen Ledlow. 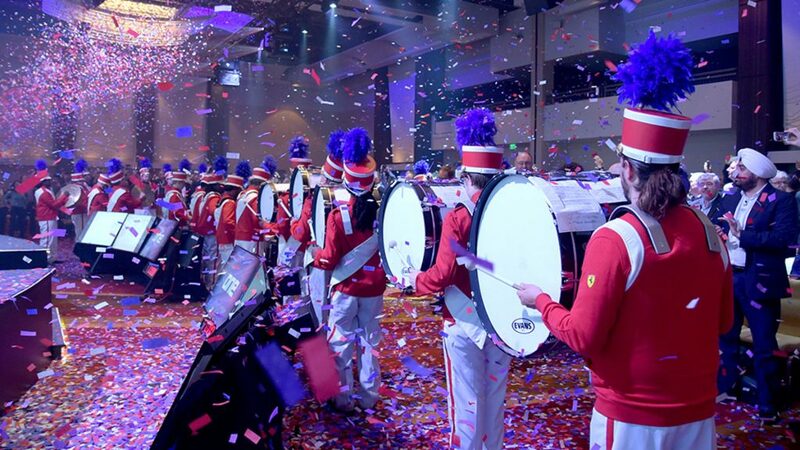 The event concluded with a video of the Diebold Nixdorf Formula One car crossing the finish line, cueing confetti cannons, pyrotechnics, and the appearance of a marching band, which both surprised and delighted the audience. 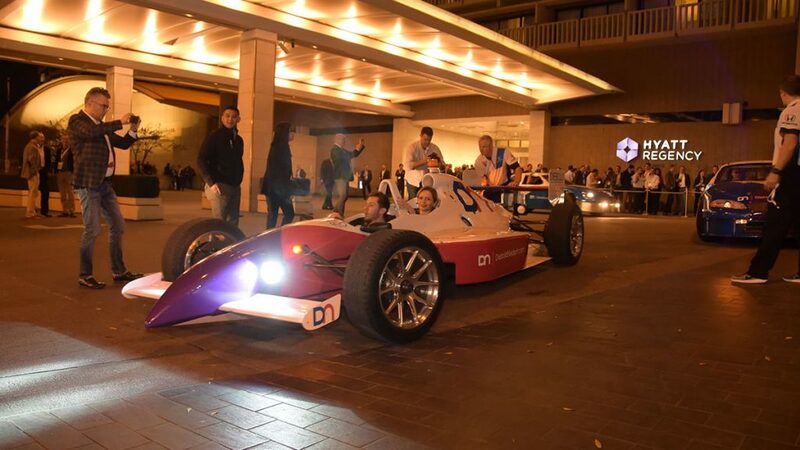 The event was a unique opportunity to get sales staff “on track” by driving a Formula One race car. 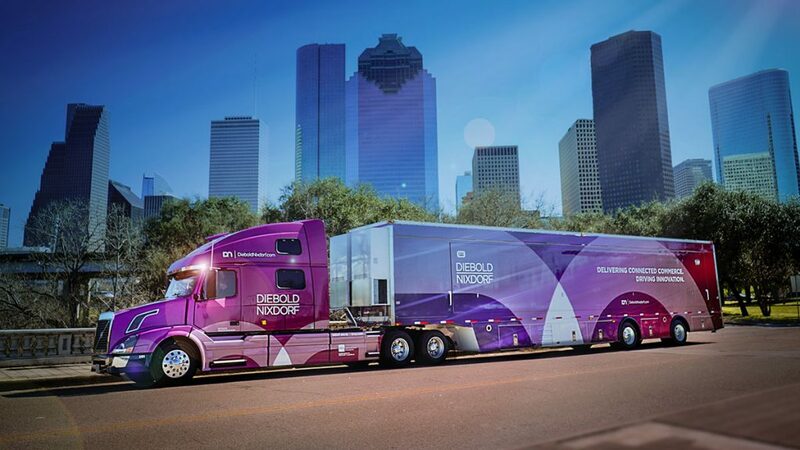 It also launched a touring road show featuring a custom-built “Big Rig Experience Truck” that will navigate across the United States. 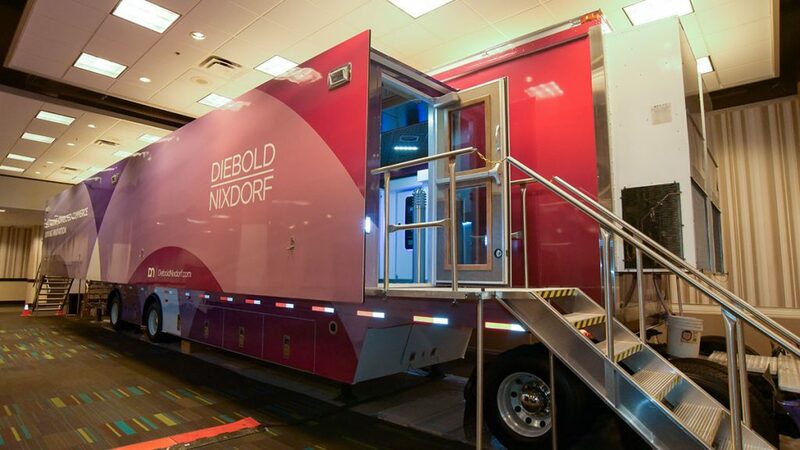 This truck is another vehicle – literally – for previewing a dozen machines to audiences in cities around the country – some of which have not yet been released to the public – and highlighting the services Diebold Nixdorf provides to a wide audience through direct experience.